Size (inches): 17.72" X 1.57" X 8.66"
Sixty seconds! That's all you've got! Sketch a picture and have your team guess the word it represents! No artistic skills are required--all you need is a little imagination and a fast pencil! It's designed especially for kids ages 7 to 12, with 1,440 kid-oriented words for quick-draw fun. 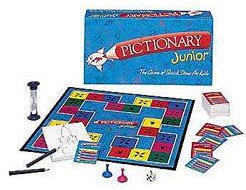 Game includes 144 word cards, with 100s of fun new words! The blue side of a card has easier words, the red side more challenging ones, for two levels of play. Announce the theme on each card (like "It's scary") before each round to hint at the word being sketched (like Monster or Graveyard), or keep theme secret for tougher play! As you sketch and guess, you'll advance along the game board to the Finish square. Then, correctly identify the final sketch to win the game! Contents: game board, die, timer, card deck, 2 pencils, 2 playing pieces, paper and instructions.